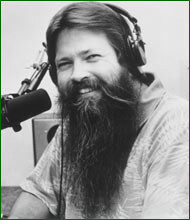 Sporting a foot long beard and an equally outrageous personality, Federoff’s national award-winning weekly radio show has been on the air since May 1986. The program is the nation’s only coast-to-coast friendly radio show. Based near downtown Los Angeles and heard on the Environmental Media Broadcasting Radio Network Saturday mornings from 8-10AM pacific standard time nationwide. While on his speaking circuit, this California native uses wit to catch the attention of his audience. It is this same lighthearted formula that fascinates his students as a college instructor and seminar lecturer. As the nation’s top garden expert, Federoff travels the country addressing contemporary, environmental and biological issues while providing information and ideas for the beginning and seasoned gardener. Holding a degree in Ornamental Horticulture, Federoff is an active member of the Garden Writers Association of America and is a lifetime honorary member of the California Association of Nurserymen, International Society of Arboriculture, Southern California Turfgrass Council, Pesticide Applicators Professional Association, Fullerton Arboretum and is a Master Gardener operated by the UC Cooperative Extension. In addition, Nick has made guest appearances on numerous local and national television programs like: ABC’s Carol & Marilyn Show, Fox Morning News, PAX TV’s Great Day America, FOX TV’s The Donny & Marie Show, Super Station KTLA, morning and evening news on: KCBS 2, KNBC 4, KABC 7, KCAL 9, KTTV 11, KCOP 13 and KOCE. He has also been featured on Korean TV and Telemundo, plus many more. Currently he is the resident on-air garden expert for Los Angeles CBS|KCAL 9 News every Saturday morning and hosts a daily 30-minute PBS television show called Things Green which can me watched via flagship station KLCS-TV from Los Angeles to other PBS stations across the country. Furthermore, he was the garden writer for the Los Angeles Daily News, 27 local area newspapers and has been featured in many trade and consumer magazines including Fortune Magazine®. Federoff has a strong entrepreneurial spirit which has catapulted him to success in many areas. A family businessman, he started his career working with his father, Bill, and brother Alex, in the construction field. They developed commercial real estate and worked under the name of A.N.B. Construction. The trio branched out to include landscape installation and weed abatement. This diversification modified their business name to include A.N.B. Industries which employed more than 60 full time employees. Nick was instrumental in building A.N.B. Industries as the largest weed abatement contractor in the United States. Armed with a Qualified Applicators License with the State of California his responsibilities included public relations and executing contracts for the County of San Bernardino, Southern Pacific Railroad, City of La Habra, City of Rubidoux and County of Orange. In addition, within the landscape installation and maintenance division, he was instrumental in job costing and administering agreements with the Federal Reserve Bank of Los Angeles, County of Orange, Sunset State Beach, City of El Toro, City of Lake Forest, Kirk Paper, Public Storage and Carl’s Jr. Restaurants. It soon became evident Federoff had the ‘gift of gab’ which offered the opportunity to host a radio show on the west coasts most powerful radio station in May 1988. The success of the show spurred off a newsletter which later became one of the country’s leading publications called the Things Green Gardening Magazine. The subscription based monthly magazine availed Federoff to become available for speaking engagements to include media forums for Dow Chemical, Pesticide Applicators Professional Association, American Heart Association, Cal State Fullerton and other prominent organizations. Soon after, he sold the magazine to develop a line of liquid plant foods which were sold nationwide. The sale of the magazine and plant food divisions gave way to further expand A.N.B. Public Relations and Marketing plus enter the radio media by syndicating what is now known as Nick Federoff on Gardening and the award winning daily short form program called the “Things Green Garden Minute.” In January of 2003 Federoff added another audio program geared for the green industry professional called ‘The Green Industry Talk Show.’ This was the first program of its kind in audio history. With Nick’s strong writing ability he has written articles for the trade, press releases, consumer awareness and business profiling. As the Internet started to develop, so did adding customers to a growing list of clients in content and web site development. Communication is Federoff’s forte. On July 25, 1999 he was awarded a blue ribbon from the State of California, Orange County Fair for Best Radio Station where he introduced the concept of Internet radio to millions of people worldwide on http://www.AdrenalineRadio.com/ Soon after he launched http://www.AdviceRadio.com/ Both stations have garnered many ‘firsts’ in broadcast journalism and technology advancement (too many to list here). Nick ‘retired’ from the landscaping business in 1998 to focus on building radio programming. Other than his own radio show he has developed 28 long and short form specialty programs hosted by experts in their respective fields in English and in Spanish for on-line listening pleasure and syndicated terrestrial broadcasting. The Cites of Long Beach and Montebello has awarded Federoff with Things Green Day Proclamations. He was the first radio and television personality inducted into the Green Industry Hall of Fame. He has also been inducted into the Montebello High School Hall of Fame along with a the Harry J. Banker Gold Leaf Award from the International Society of Aboriculture. In addition his television show has garnered two television industry recognitions The Telly Awards along with many other accolades.